Advancements in biosensor technology are becoming increasingly common in the consumer space, with wrists adorned with Fitbits or similar devices, clothing embedded with “intelligent” fibers, and personal safety devices seen in healthcare facilities across the nation. Our culture is increasingly accustomed to tracking health metrics through smartphones and simple recreational wearables. In the pharmaceutical space, we are now seeing where success in the consumer segment can translate to value-adds for clinical trials. In traditional pharmaceutical interventional clinical trials, collection of data for primary and secondary endpoints (objective and/or subjective) must take place in a clinical setting to maximize quality control and meet FDA requirements. In some cases, the FDA allows secondary endpoint data to be collected remotely (usually in the home setting), often through questionnaires completed by patients and/or their caregivers. Such data are usually subjective and as such are typically not sufficient for primary endpoint analysis in interventional trials. Novel wearable biosensors change the calculus by creating the opportunity to collect objective data outside the clinic. While the FDA has not issued full guidance on the use of data collected by wearables for interventional trial endpoints, physicians and other providers are employing these devices to create a more holistic approach to managing patients, and innovative validation studies are taking place which will improve tracking and possibly uncover novel clinical endpoints. Sponsors and their collaborators that embrace the technology and deploy them to meet key unmet needs will enjoy a competitive advantage over those who wait. Properly validated and calibrated, motion-sensor-based wearables would meet unmet needs in the study and treatment of neurodegenerative disorders marked by mobility and/or movement dysregulation. Specifically, these devices are designed to collect continuous real-time clinical data over periods of time not realistic in clinical settings such as trial centers. Access to previously unobtainable data may result in significant advances in disease management and long-term outcomes. Admittedly, protocols need to be considered and adjusted in light of these devices. Data captured outside the current, in-house clinical setting can be questioned in terms of strict quality control, regardless of the technical and objective components of the technology. The security of patient data is also a concern. We do not discount these issues, but our analysis suggests that these challenges can be overcome through both technical applications and process improvements. The following sections outline specific disorders in which opportunities exist to deploy wearable technology, the degree of progress that has been made with the use of wearables, and an assessment of how wearables can improve clinical trials. Multiple sclerosis (MS) is a chronic neurodegenerative disease marked by acute relapses and progressive disability. One of the clinical endpoints used to assess MS is physical disability. As MS progresses, a patient’s mobility impairment increases, resulting in progressive changes in gait characteristics. Gait analysis is an obvious target for motion sensor technology, and it is an area in which much research had been completed prior to use in MS. As a result, developers of MS-specific wearables have had the advantage of being able to leverage a significant amount of historical data and wisdom for validation. Despite increasing advancements in gait sensors, especially the more advanced “nonwearable” versions designed for clinics, most MS centers do not employ them. A standard clinical test is a timed 25-foot walk during which patients are asked to move as quickly as they can, but safely. The gait of a patient is subjectively scored on various measures by a trained observer. The limitation of this approach is, of course, the human observer. The test is more reliable when mobility impairment progresses and becomes more obvious visually, but it is not suitable for detecting subtle gait parameter changes associated with early stages of impairment. Wearable and nonwearable sensors have now advanced enough to detect this early impairment, even in MS patients who have normal walking speed. The significant value we see coming from wearables would be the discovery of key novel endpoints that may represent improved targets for pharmaceuticals. In MS, a wearable capable of measuring early and previously unobtainable gait impairment would provide new opportunities for clinical intervention that could improve long-term health outcomes through earlier treatment. Such a wearable would represent a significant advancement in MS and would not require additional clinical site visits, which are often very inconvenient for patients. Symptomatic Parkinson’s disease (SPD) can present a host of issues related to cognitive impairment, mobility, and speech, among others. Key clinical endpoints in interventional SPD trials (and other neuropsychiatric disorders such as Alzheimer’s) are associated with subjective observational data due to a lack of technology capable of collecting objective, clinically relevant bio signal data. Even in large pivotal studies, remote data collection is limited to patient diaries and standardized rating scales. The quality of such data is often lowered due to noncompliance, diary fatigue, and selective reporting due to patient bias. In addition, challenges around variability and reproducibility of subjective data often occur due to bias in how physicians and patients interpret clinical events. The mobility dysregulation seen in moderate and severe SPD patients (e.g., dyskinesia and tremor) represents an opportunity to generate objective data through wearable sensor technologies. Remote data collected in this manner would reduce bias, provide physicians with crucial information on compliance, and increase overall confidence in investigations into efficacy and safety of drugs in clinical trials. The silver bullet for SPD is a wearable device incorporating sensors that can accurately and precisely measure disease-related bio signals and also separate these signals from normal movement. This capability can be taken a step further by incorporating artificial intelligence/machine learning (AI/ML), wherein the algorithm can learn, for example, what a "mild" tremor looks like for a specific patient versus a "severe" one. Devices can make this learning more efficient, scalable, and less error-prone. The technology for SPD is not quite appropriately advanced yet. When it is, there will be an important shift from subjective to objective data in SPD trials. This advancement will reduce long-term costs as patients are more compliant due to the incorporation of non-invasive devices that do the work for them, removing the need to record ultimately biased and inaccurate information in a daily diary. Moreover, such devices will generate objective data in FDA-required post-approval trials in which the long-term effects of treatment are analyzed. To date, activity in this area has been primarily in validation studies establishing proof of concept for using wearable technology to capture SPD patient data remotely. The Parkinson@home study recently demonstrated the feasibility of using multiple sensors to capture SPD patient data in a relatively large population during their daily routines. This is a step in the right direction, but unmet needs remain with regard to the sensors themselves. 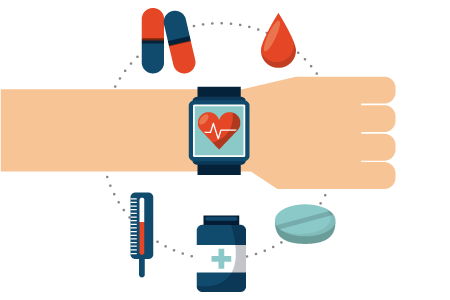 It is prudent for sponsors, clinical research organizations (CROs), and other stakeholders in the clinical trials industry to closely monitor and advance the development of new wearable technologies in this space. Those pharmaceutical and healthcare information technology companies that create solutions will be well poised to integrate the technologies into their clinical trials and gain efficiency, effectiveness, and competitive advantage. Huntington’s disease (HD) is a slow-progressing genetic disorder associated with symptoms including chorea (involuntary movements), issues with voluntary movements such as unsteady gait, and cognitive impairment. Overall, new drug development in HD has been challenging: a 2017 study assessing all HD trials registered in the WHO Clinical Trials Search Portal found an overall success rate of 3.5 percent. The low success rate of trials can be attributed to several factors. First, the heterogeneous nature of symptoms and slow progression of the disease make it difficult to link therapeutic effect with reduction in symptoms, requiring more patients to power these trials. Second, as a rare genetic disorder, there are challenges in patient recruitment and retention, driving up trial costs and extending timelines. Despite these challenges, there are several clinical candidates being studied in ongoing trials. The current gold standard in endpoint selection in HD trials is the physician-generated Unified Huntington’s Disease Rating Scale (UHDRS), which takes into account motor, cognitive, behavioral, and functional factors. However, as is often the case with rating scales in the neurological space, the UHDRS generates subjective data and is limited to use in the clinic. Access to clinically relevant (and more frequent) objective data remains a key unmet need in HD. Sensor-based wearable technology does have the potential to address this unmet need by allowing clinicians to collect objective real-time data outside of the clinic for parameters related to motion. Open-Pride HD, a Phase 2 study being conducted in collaboration by Teva and Intel, includes a sub study that incorporates a smartphone and smartwatch equipped with sensing technology to continuously measure movement and function in HD patients. If this validation study can demonstrate clinical value through the collection of objective remote data (continuous or punctuated), then more widespread development and adoption of these technologies would be expected in the context of HD interventional trials. Sensor-based technologies for HD trials are exciting for industry and patients alike. We expect that sensor-based device development and validation will be the focus in the near term given such demand. If HD wearable technology reaches the point in which motor impairments can be accurately and precisely measured remotely, the highest value would most likely come from the potential emergence of a novel key trial endpoint. For this to happen, the endpoint would have to necessitate long-term continuous data collection that would be impossible to collect in-clinic. Otherwise, the wearable data generated will likely be categorized as supplemental to clinically derived data. In the context of interventional clinical drug trials, wearables have the potential to uncover clinically relevant but currently unobtainable endpoints. The value of such outcomes will be significant, expanding the amount of objective data available for analysis. The opportunities presented by wearable technology are especially significant in trials focused on disease states such as MS, SPD, and HD. In these cases, data from wearables will augment data generated in clinics, enhancing the analytic and diagnostic abilities of trial sponsors. We must recognize, especially in these neurodegenerative diseases, that some data simply cannot be acquired in brief, infrequent, and structured in-house clinics, and wearable technology must be created and deployed to meet current unmet needs in trial design. Sponsors and the FDA are well advised to consider the joint use of wearable technology and advanced AI and ML to obtain the best outcomes for patients. There is value in harnessing wearables in efforts to uncover novel clinical endpoints, long-term monitoring in post-approval studies, pharmaceutical validation programs, establishing or leveraging holistic patient management, and implementing rehabilitation regimens, among others. Continued advances in the consumer wearables segment have generated growing interest in tracking health metrics in real time and will continue to fuel innovation in clinical research. Even more broadly, applications that exist in patient engagement and empowerment efforts will lead to valuable gains in reputation, brand awareness, and competitive advantages for pharmaceutical and biotechnology companies that embrace these budding technologies. Stephen Ames is a senior director with more than seven years at Fuld + Company and previous experience in market research and forecasting, technology licensing, and life science R&D in both corporate and academic settings. He has led multiple large competitive strategy projects for household names in the biopharma space among others across the health and life sciences continuum. He has expertise in oncology (specifically breast cancer), neurology, endocrinology, drug delivery, and company/regulatory interface including life cycle management.